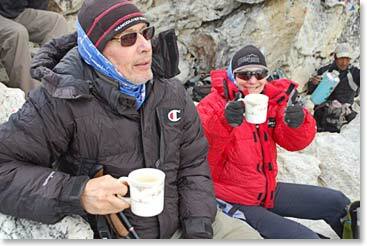 This is Temba calling with a dispatch from Pheriche at about 14,000ft/4,270m. We spent two nights at base camp before heading down for our very beautiful hike through the valley to Pheriche. Everyone feels good to be down at a noticeably lower altitude. 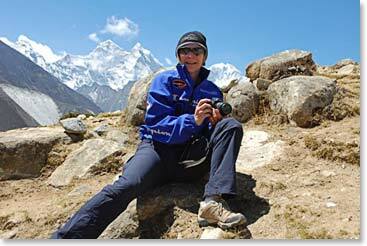 I have Allison, Steve and Wes with me, but Dave, Drew and George are already down in Namche. We will all reunite in Namche tomorrow. I'm sure we'll probably all have a great night's sleep being down from high altitude tonight. Allison stops to take some pictures on the trail. 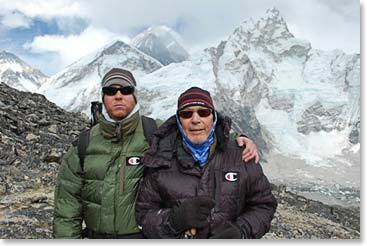 Steve and Wes bundled up near Base Camp.